Unique holiday accommodation steeped in history in the historic centre of Quorn. Perfect base from which to enjoy the range of activities in the majestic Flinders Ranges, and in Quorn itself. The Savings Bank of South Australia (SBSA) building dates back to the early 1890's when it was built as a saddlery. Later converted into a shop and private Quorn residence by Mr J Rock, the Savings Bank of South Australia purchased the building in 1909 for £1,100 and opened a branch in the important northern centre. The SBSA later became the State Bank of South Australia and then a Bank SA branch before it closed on 13th September 1997. Fittings and furniture in the banking chamber were panelled with polished cedar and the counter was edged in brass, with an iron foot-rail mounted on the customer side of the counter. Gas was used for lighting the premises. The SBSA building in Quorn was subsequently renovated and is now available as comfortable spacious holiday accommodation, centrally located at the gateway to the central and northern Flinders Ranges. The old Bank Manager's residence is tastefully presented, with comfortable accommodation, available for holiday and vacation rentals. Featuring 2 double bedrooms, both with queen sized beds, 1 twin bedroom, 2 bathrooms (one on each floor), kitchenette, two large sitting rooms and off-street parking. There is usually plenty of parking on First street too. Fully air-conditioned with reverse cycle air conditioning in the bedrooms and lounge rooms upstairs and fully air conditioned downstairs. An electric barbeque is available on request. The SBSA - Old Quorn branch provides comfortable accommodation all year round. The Savings Bank of South Australia - Old Quorn branch is within walking distance of the towns pubs, supermarket, bookshop, art galleries, craft shops, laundromat, post office, newsagent, chemists, Flinders Ranges Visitor Information Centre and the famous Pichi Richi Railway Station. Highly recommend you visit the PRR museum in the train station and also book aa tour to visit the railway workshops, which are located just past the hospital. Refer to the Pichi Richi Railway website for information and tickets. The Flinders Ranges Visitor Information Centre is inside the Quorn Railway Station. In 1878 the The Pichi Richi Railway began as the Port Augusta and Government Gums Railway. The Quorn railway station became the cross-roads station when you travelled north to south, or east to west across Australia. Quorn Railway Station is a historically significant station and it was featured on an Australia Post stamp, in October 2013 showing four beautiful and old railway stations around the country. During the Second World War, a great number of Australian troops passed through Quorn heading north and south. The Quorn Country Womens Association - CWA served over one million meals to troops passing through by rail. For more than 40 years Quorn has been the home of the Pichi Richi Railway Preservation Society. The local produce and craft market is held on the last Sunday each month in the Quorn Town Hall, just one block's walk from the SBSA. Here you will find locally grown food like figs, apricots, nuts, (depending on the seasons' produce) chutneys, jams, sauces and some unique craft gifts. In Quorn town there is the lovely arid flora "Powell Gardens" at the eastern end of First Street which is well worth a visit. Here you can see hundreds of different flora which exists in this climate of extremes. The ABC Gardening Australia program visited these gardens and you can see more info about them on the Gardening Australia website. Working bees are on each 2nd Sunday and 4th Thursday of the month. Recently, Flinders Ranges Council renovated the "Quorn and District War Memorial Swimming Pool" so if you would like to visit check the opening hours at the FR VIC, opening times vary according to season and temperature. Within the original RW Foster's Great Northern Emporium, also in First Street is Emily's Bistro where history in retail shopping stopped. You can drink or dine here and Flinders Flicks show monthly movies; We recommend a visit and suggest you pre-book for dinner or the movie nights. Just 45kms away is the interesting Kanyaka ruins an interesting site to explore. The Flinders Ranges extend in a north-south direction for about 430km from near Port Pirie to Mount Hopeless in South Australia. The ranges are composed of folded and faulted sediments of the Adelaide Geosyncline. This very thick sequence of sediments were deposited in a large basin on the edge of the ancient continent of Rodinia about 840 million years ago. During the Cambrian period approximately 540 million years ago, the area underwent folding, buckling and faulting into a large mountain range, the eroded stumps of which can today be seen as the Mount Lofty and Flinders Ranges. Before erosion, the ranges are though to have been up to 40,000 feet high. From the SBSA it's an easy drive to Warren Gorge on the sealed road, and appropriate for day trips to Brachina Gorge, Wilpena Pound, Blinman, Hawker, Cradock (renowned for sunsets, pub food and art on display), Hammond, Bruce, Melrose, Moockra Tower and Laura. Wilpena Pound is a world class attraction - a large, sickle-shaped, natural amphitheatre covering nearly 80 square kilometres, containing the range's highest peak, St Mary Peak (1,170m (3,840ft)) and adjoining the Flinders Ranges National Park. Wilpena Pound is well worth a scenic flight available from many surrounding points. The northern ranges host the Arkaroola wilderness sanctuary and the Vulkathunha-Gammon Ranges National Park. The central part of the ranges are notable for the Pichi Richi scenic railway and the southern ranges feature Mount Remarkable National Park and Port Germein gorge. Fossils are found in the Adelaide Geosyncline - those discovered in the Ediacara Hills of the northern Flinders in 1946 are of worldwide significance for being some of the oldest examples of fossilized animal life ever found. They date from the very end of the Neoproterozoic, and in 2004 the location gave its name to the last geological period of the era, the Ediacaran. In 2018 two new fossils were discovered in the Flinders and named after Barrack Obama and Sir David Attenborough. The flora of the Flinders Ranges consist of species adapted to a semi-arid environment such as sugar gum, cypress-pine, mallee and black oak. Moister areas near Wilpena Pound support grevilleas, guinea flowers, Liliaceae and ferns. Reeds and sedges grow near permanent water sources such as springs and waterholes. Since the eradication of dingos and the establishment of permanent waterholes for stock, the numbers of red kangaroos, western grey kangaroos and euros in the Flinders Ranges have increased. The yellow-footed rock-wallaby, which neared extinction after the arrival of Europeans due to hunting and predation by foxes, has now stabilized. Other marsupials include dunnarts and planigales. Insectivorous bats make up a significant proportion of mammals in the area. There are a large number of bird species including parrots, galahs, emus, the wedge-tailed eagle and small numbers of water birds. Reptiles include goannas, snakes, dragon lizards, skinks and geckos. The streambank froglet is an endemic amphibian. 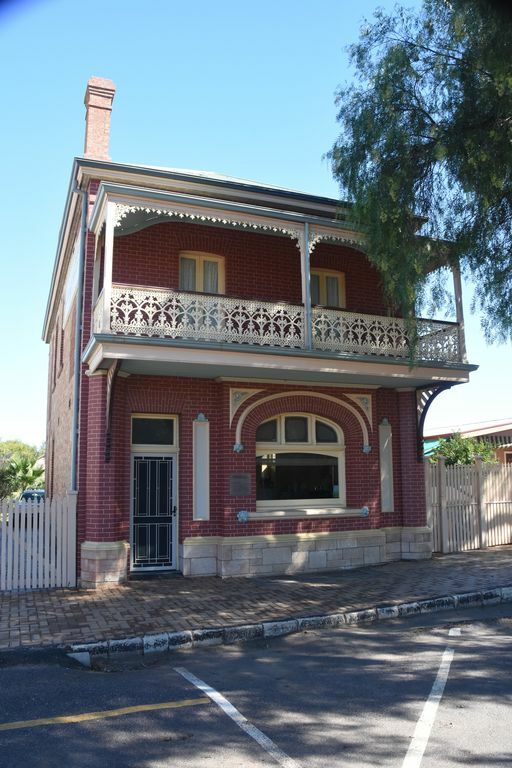 The Savings Bank of South Australia - Old Quorn Branch is located in the historic centre of the town. It was a great house for the 5 of us for 3 nights. Plenty of room, great position in a lovely town. Thank you for your kind comments and glad to hear you enjoyed your visit to Quorn and your stay at the Savings Bank of South Australia. Great house with so much character. We loved the property and it would certainly suit larger families or groups of friends as the place is huge. We are so glad you enjoyed your visit - please come again! My husband and I spent five nights here and we loved it! Spacious with very comfortable beds and top quality linen. The washing machine was an added bonus. The small town of Quorn was a great base from which to explore the Flinders Ranges. There was a supermarket, post office etc. as well as numerous cafés. (We loved "Emily's Emporium".) If your budget allows take a flight over Wilpena Pound in order to fully appreciate the scope and magnificence of the amazing landscape. Also be sure to dine on a "Feral Platter" at the Prairie Hotel in Parachilna. Delicious! Lovely accommodation with nice touches of history throughout. Conveniently located and spotless. We would definitely come back. Dear Bernard - thanks for your note. We love it too and sharing it with people helps to preserve this piece of history. We stayed for a week; Quorn is a pretty town and the old bank is conveniently located close to everything. The surrounding countryside was so lush and green - water flowing in the creeks. The old bank building was an attraction - it was fun having the passing pedestrians peering in on us and checking it out! The house was comfortable and well fitted out; cooking options were somewhat limited but this allowed us to enjoy the cafes and hotels so close by. It was lovely to return to a roof, shower and bed after a long day's walk or climb in the beautiful Flinders Ranges. Apologies for the belated reply, thank you for your comments, we do appreciate the time you took to share your experience and hope you can visit Quorn again and stay at our lovely SBSA which we continue to work on improving. Although very spacious, the building felt cosy, comfortable and homely - it lacked nothing. We thoroughly enjoyed our stay and were sorry to leave. We hope we get the opportunity to stay again some day and would definitely recommend this property to family and friends. Dear Davina, Thank you for your positive feedback, it is very much appreciated. We hope you will be back too as there is heaps to do in Quorn and the sorrounding area. Keep an eye on our website as we update it with upcoming events and some of them might be of interest and give you a reason to visit the SBSA again and discover more of Quorn and Flinders Ranges.